I has the pleasure of talking with Steve Klindworth, owner of UAVDirect.com, yesterday about their new heavy-lift octocopter that is designed for professional photography and video production use. At just over $10,000 this is not a model for the average hobbyist, but when you look at all of the features that they are packing into this model, I can see professionals flocking to get a closer look when they are ready for their next aerial rig. The Zero Tech E1100-V2 uses a Gemini Autopilot system with a high-end 3-axis brushless gimbal that is designed to work with the Canon 5D Mark III. 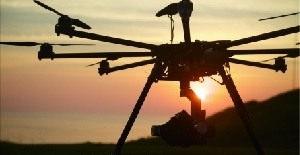 The copter was designed with the needs of aerial film makers, land surveyors, and aerial photographers in mind. The Gemini flight controller has built-in waypoint functionality that can continually repeat the flight pattern for precise aerial photography and land surveying. To protect your investment, the E1100 has One-Motor-Fail Protection that is automatically enabled to keep the copter in the air in the event a motor stops working. Should there be a more catastrophic failure, the on-board parachute will automatically deploy bringing the copter to the ground with minimal crash damage. 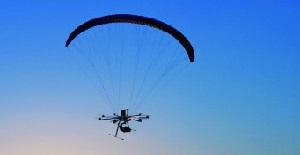 The pilot can also deploy it manually if necessary. The frame is designed to be portable to easy transportation between shoots and further enhancements were incorporated to make assembly a very quick task.